1998 McCall's sewing pattern # 9233. Misses size 18. Pants - trousers - jeans - slacks. Relaxed or slim fit pants have fly front zipper; pants have narrow waistband, front and back darts; trousers and jeans have front and back pockets with waistband and belt carriers. More new and vintage sewing patterns listed. Measurements: Waist 32". Hip 42". 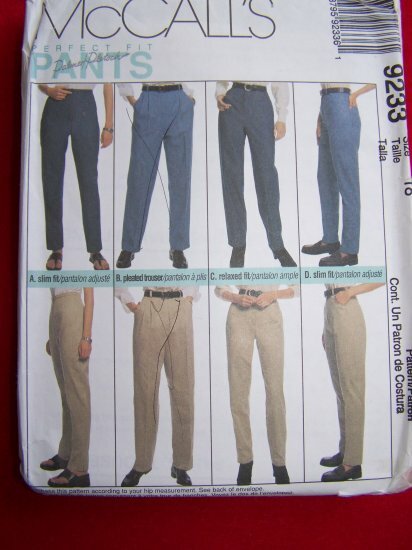 Suggested fabrics: Cotton and cotton blends - cotton twill - denim - poplin - gabardine - chambray - lt wt wool and wool blends - featherweight corduroy - lt wt velveteen. S & H to USA is $2.50 and only $1.00 for each additional sewing pattern..